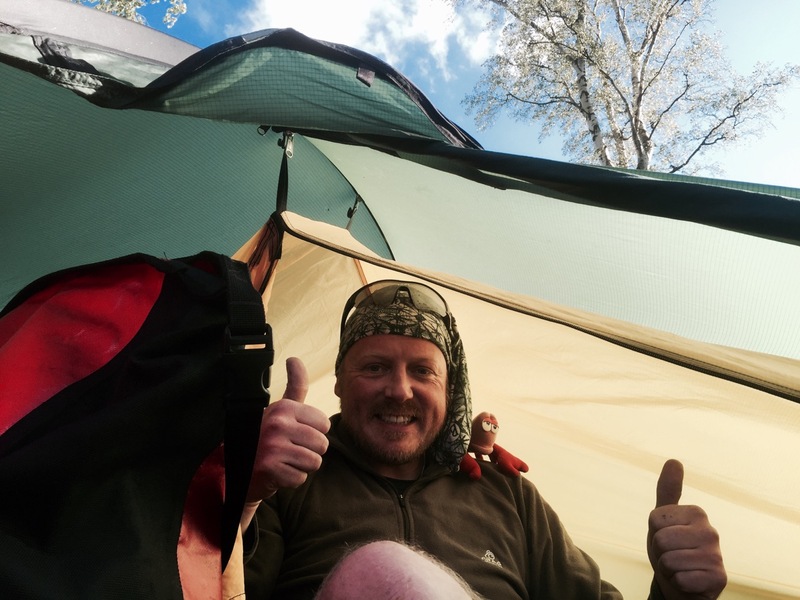 I woke up and listened; only a faint rustling of the tent canvas, the wind had dropped, and it was sunny! Could this be the glorious day’s cycling I’d been waiting for? Feeling buoyed by the thought that today was going to be a good’un, and with a new country in my sights, I was up, breakfasted and packed in good time. The campsite cat brought me a present, a mouse wrapped in leaves, which was a bit odd, and then ducks started following me around. 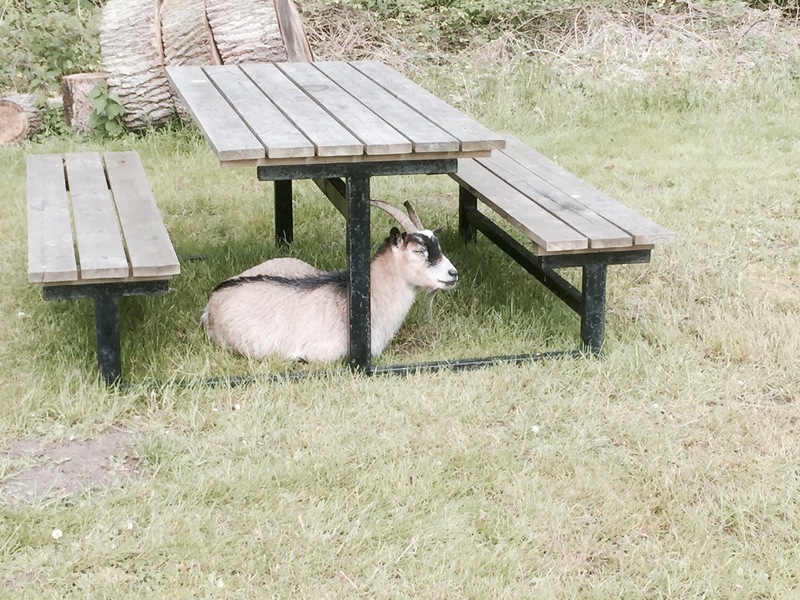 When the goats in the mini zoo started bleating I started to wonder if I’d developed Dr Doolittle traits overnight, or maybe this was all a dream and I was in fact still asleep, and it wasn’t such a nice day after all. Not wanting to consider the latter a possibility I got on the road quick. 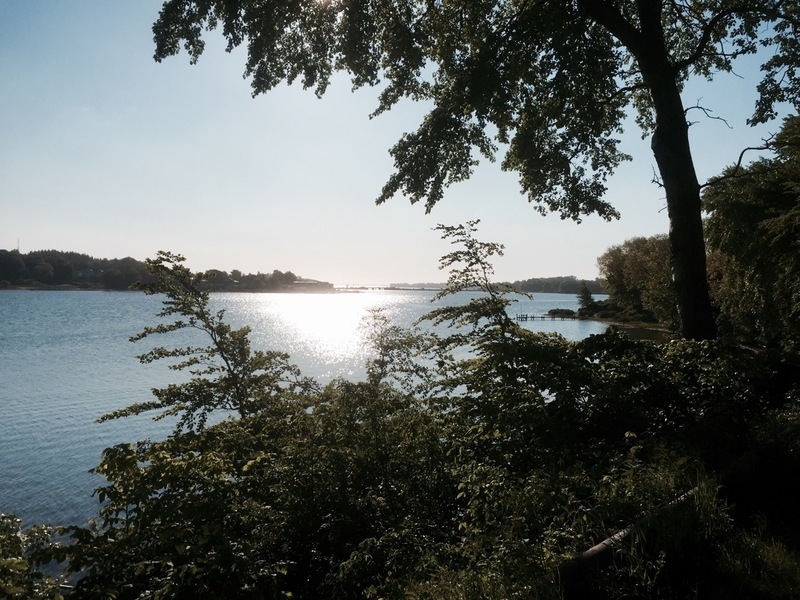 There were plenty of people up early, paddling in canoes, or sailing in small yachts down the narrow stretch of water between the campsite and Svendborg. 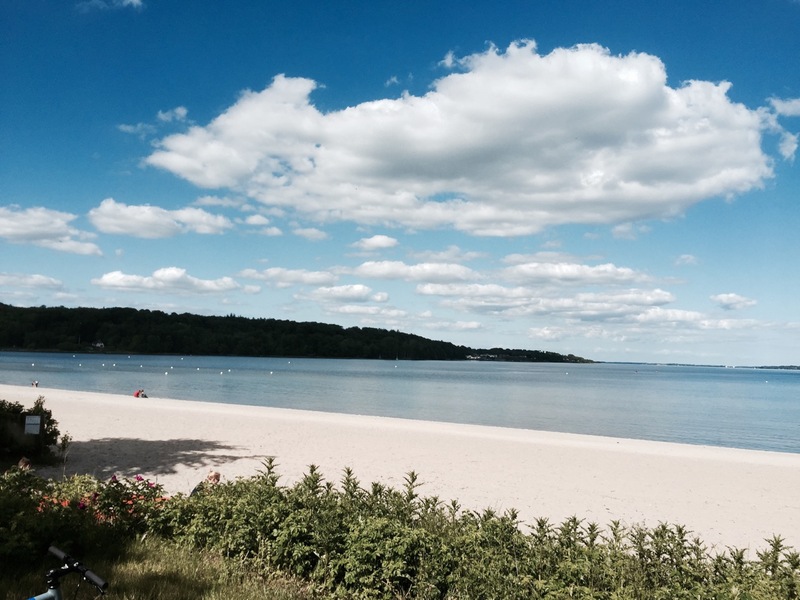 It all felt very relaxed and holiday like. 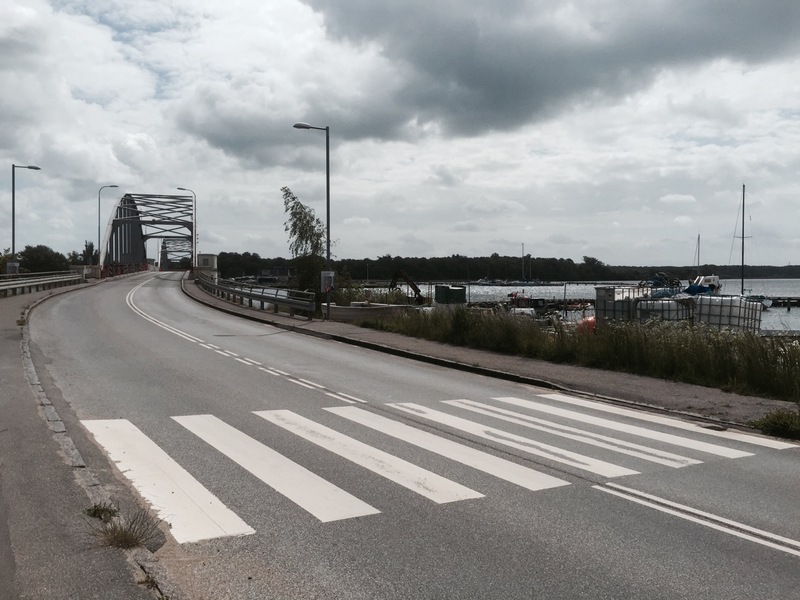 I rode over the bridge to Svendborg and then turned left, following nice cycle paths alongside the road to Faaborg. The scenery was more varied and interesting than yesterday, with a few hills thrown in for good measure. 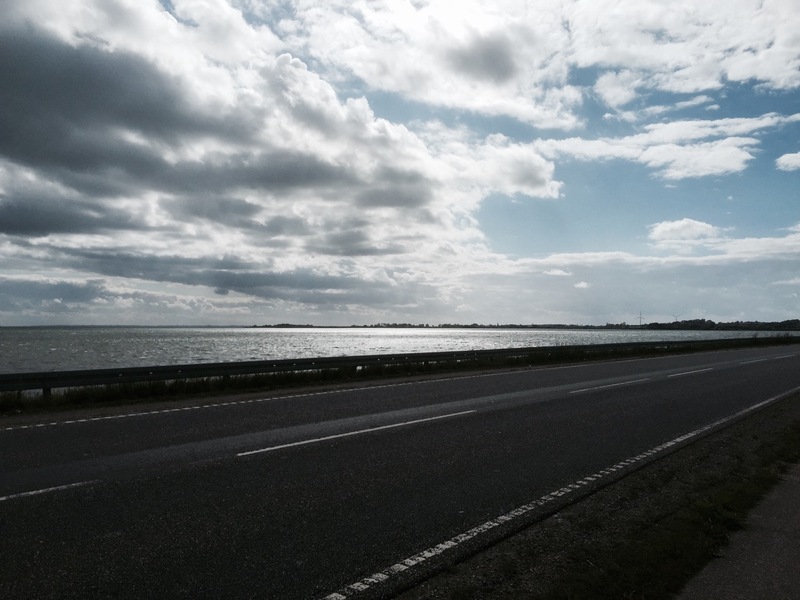 It was so nice to be cycling without a headwind. I hardly looked at my Odometer, and could just relax and enjoy the sunshine and countryside. Before long I reached Bojden, just as the ferry arrived from Fynshav; a short 10km crossing to Als and Jutland. After enjoying a hot chocolate and pastry on the ferry I pedalled on from Fynshav to Sonderborg, which didn’t seem to take very long, arriving in time for lunch. I walked through the town stopping to buy a hotdog from one of the many purveyors of such fine foodstuffs. 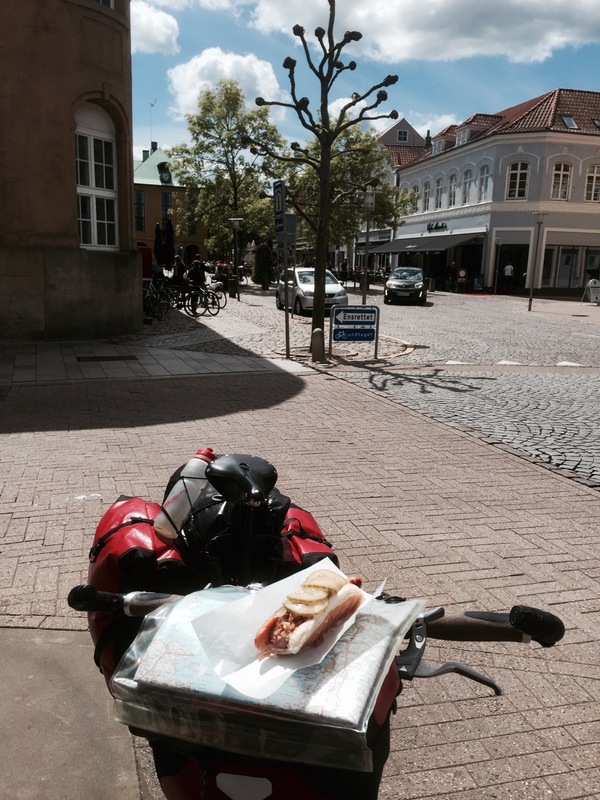 Hotdogs in Denmark appear to be very popular, with several different varieties. I preferred the Ristet, which comes inside a bun and is topped with pickled cucumber, crispy onions, mustard, ketchup, and remoulade. 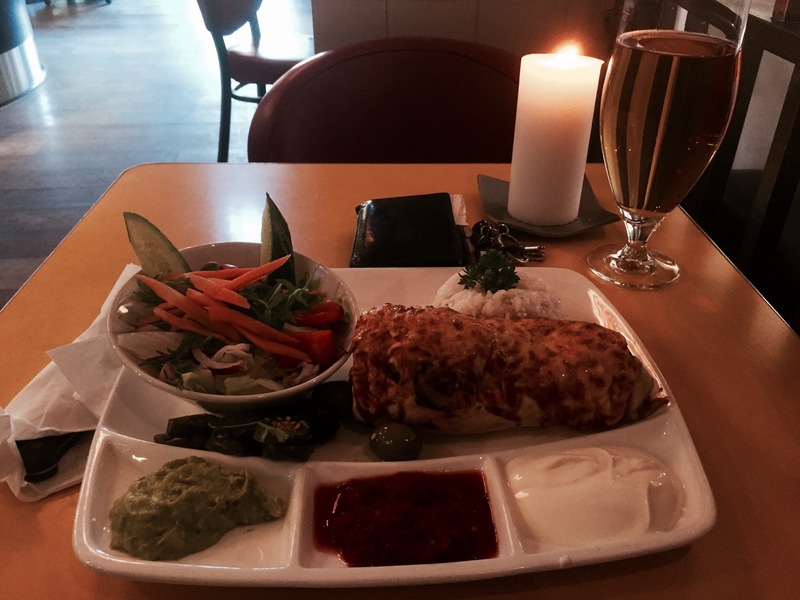 Needing to use up my Danish Krone and I decided I’d eat my way through the rest of Denmark, and had another Ristet for good measure; I’ve been losing too much weight anyway, at least that was my excuse. I paused on the bridge out of Sonderborg, hoping that the folks at home might be able to see me on the webcam, but also to stop as the middle section was raised for a boat to come through. Unfortunately I couldn’t delay long as it was just too busy, and I’m not sure I timed it right for the webcam. I cycled on to Dybol, then turned South and crossed the small island before rejoining Jutland; lovely quiet roads and cycle paths again. I followed the Route 8 cycle path a lot of the time, not out of any particular design, it was just going in the right direction. I was also having a day of being open to possibilities, so if I saw a cycle track or nice road that went the way I wanted it to, I took it. 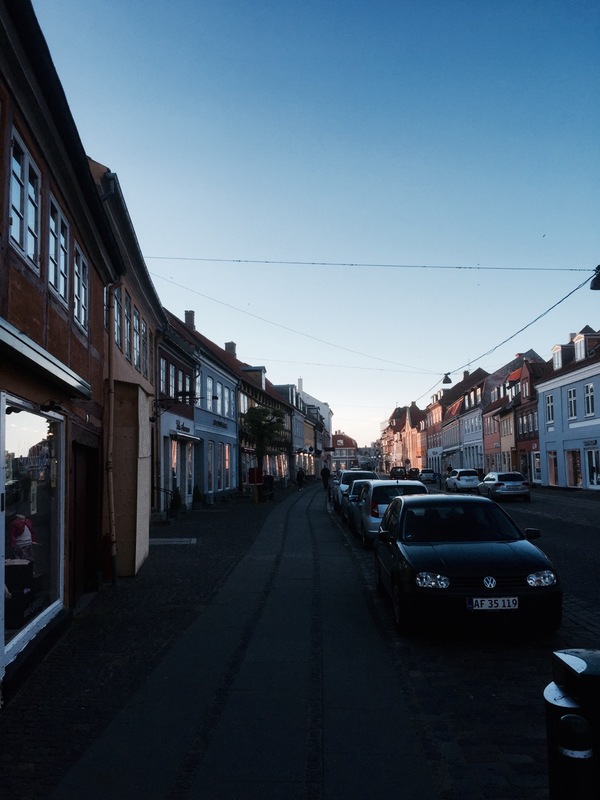 I rode down the side of Flensburger Ford, through a number of small towns. This is obviously quite a big tourist spot, and very beautiful, with some lovely yachts out on the water (when I win the lottery etc). 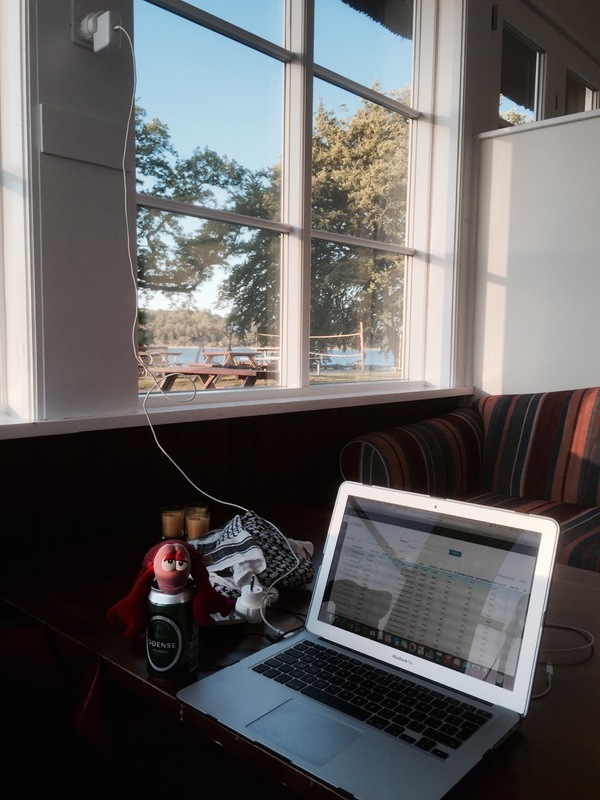 After relaxing next to the Fjord for a bit, and of course taking on vital nourishment, I thought I’d better get on with the task at hand. 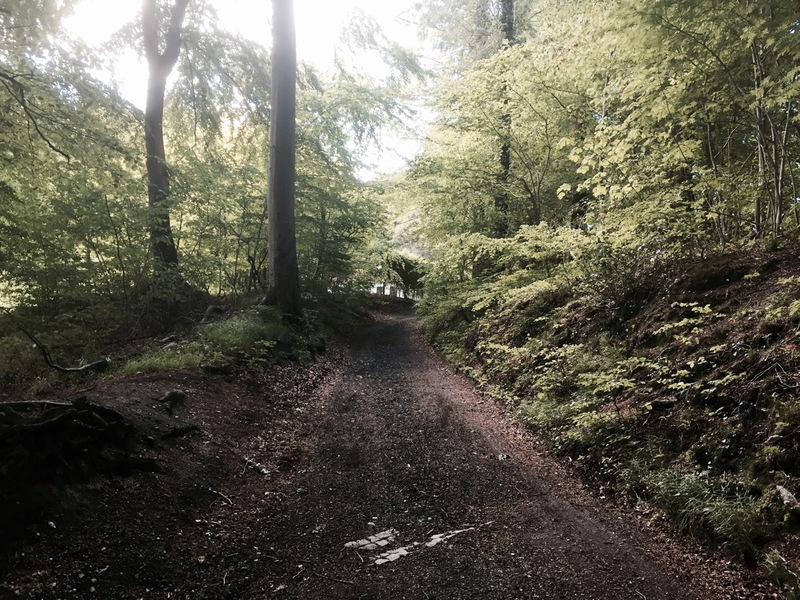 I continued to follow Route 8, which decided to take me off-road and through the woods for a bit, as I got closer to the border with Germany. 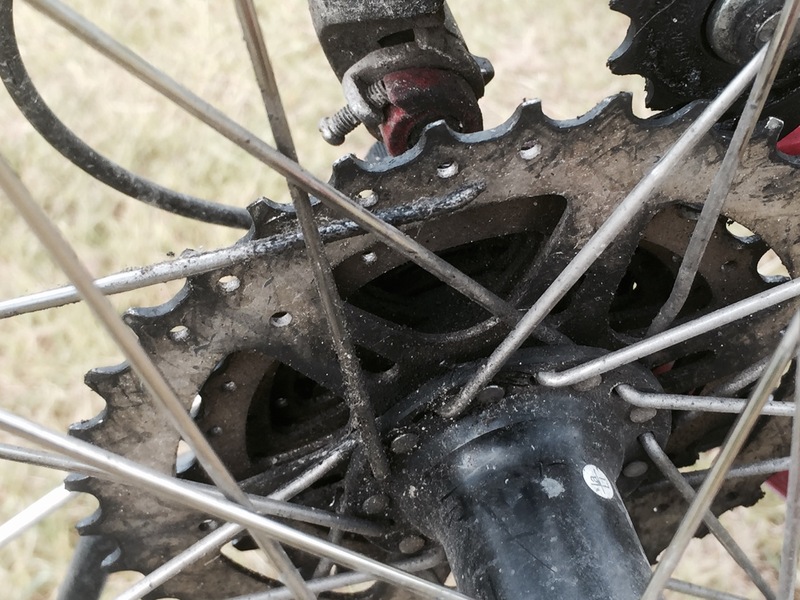 It was slightly awkward cycling for a bit, and my bike developed an annoying squeak which I couldn’t identify the source of; it’s still doing occasionally now, a few days later, and I don’t know what’s causing it – I’d better investigate further in case it’s a problem that’s going to get worse. I finally made it out of the trees, which had provided some welcome shade and smelt nice, and could see Germany across the bay. There was a beach and people swimming; in fact one cyclist arrived in the spot below and decided to go for a swim; I nearly joined them. In this case I resisted the temptation of a dip, as I needed to get through Flensburg, and carried on towards the border. I was keeping an eye out for customs officials as I’d seen a few signs suggesting they might patrol round here, but didn’t see any. 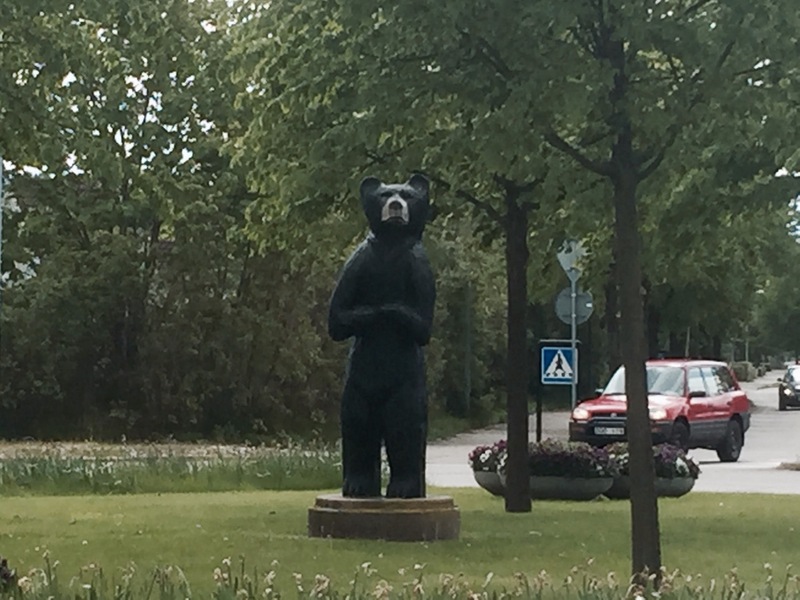 In fact, when I got back on the road, I barely noticed crossing into Germany. 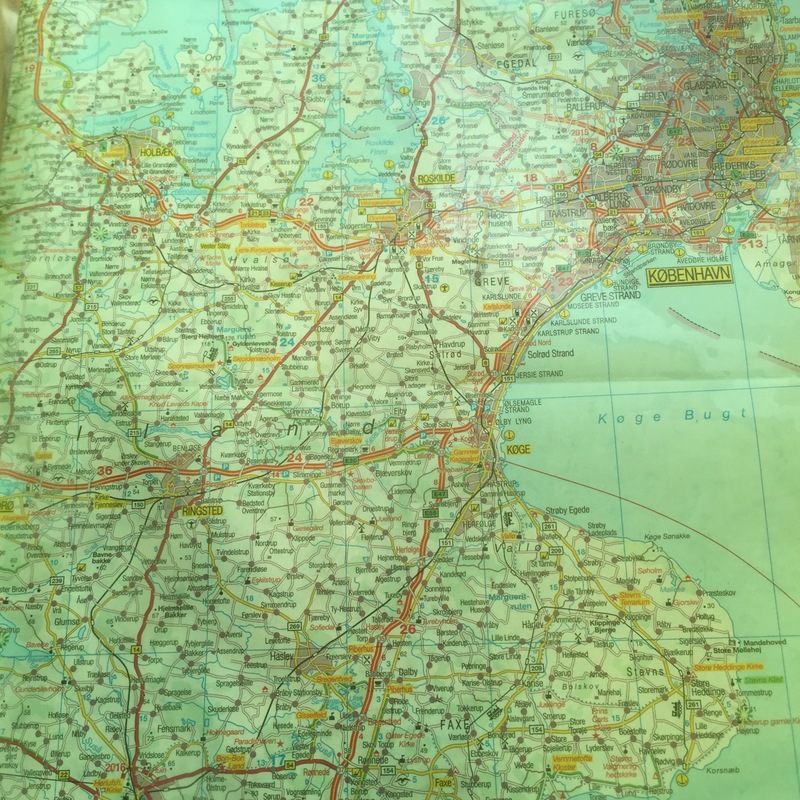 I was in country number 6 of this tour! 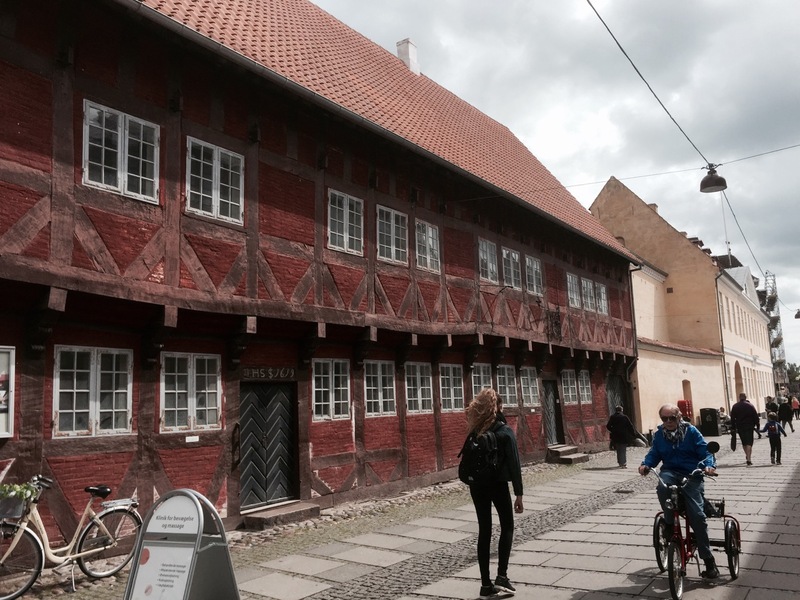 I rode on to Flensburg and walked through some of the city. Again there were a lot of tourists out and about, enjoying the sunshine and street cafes. 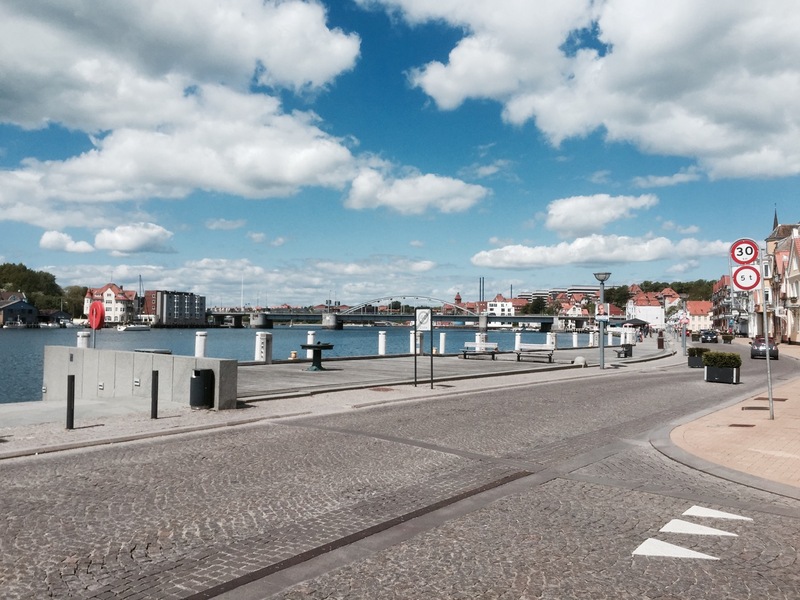 Flensburg looks nice, with some lovely older parts to it. 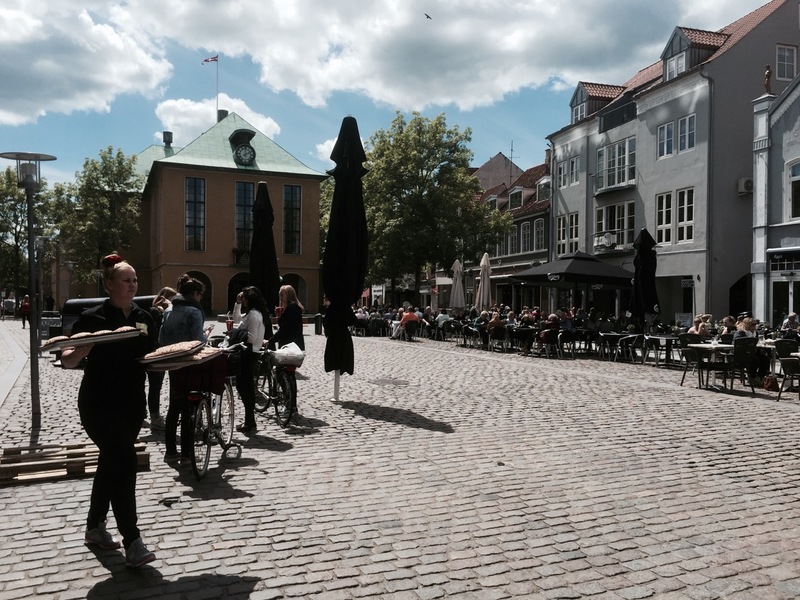 The cobbled streets were slightly jarring on my still wonky hand, and always make me worry about my wheels, however I made it through and cycled South the Jarplund, where the ACSI app on my phone told me there was a campsite. 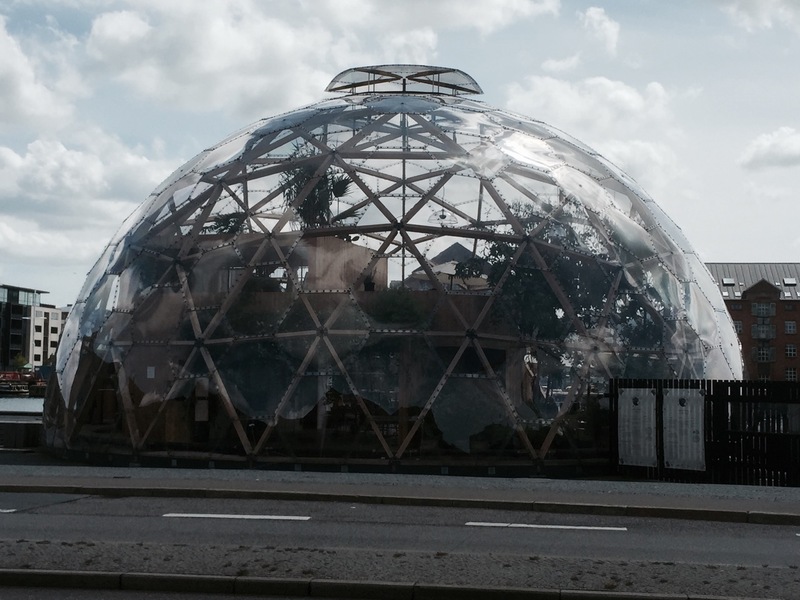 It was a bit of a maze getting out of Flensburg whilst trying to avoid the busier main roads, and stay on cycle paths. I made it to the campsite but had to go around the houses a bit to get there. At the campsite I met up with 3 other cycle tourers from Stuttgart, as well as an Italian motorcyclist from Italy; Larissa, Romulus, Alex and Claudio. 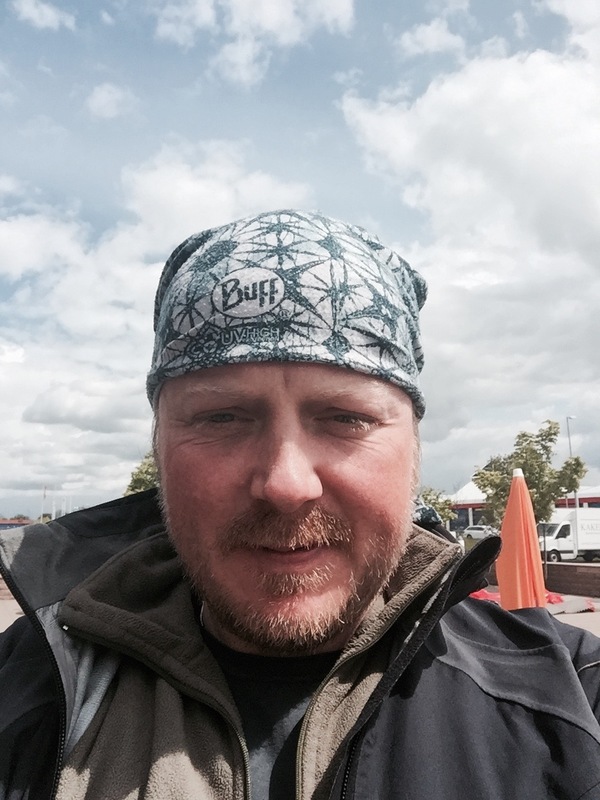 Claudio is on his way to Iceland, and will be getting the ferry with his motorbike from North Denmark; there are a limited number of ways of getting to Iceland by ferry. 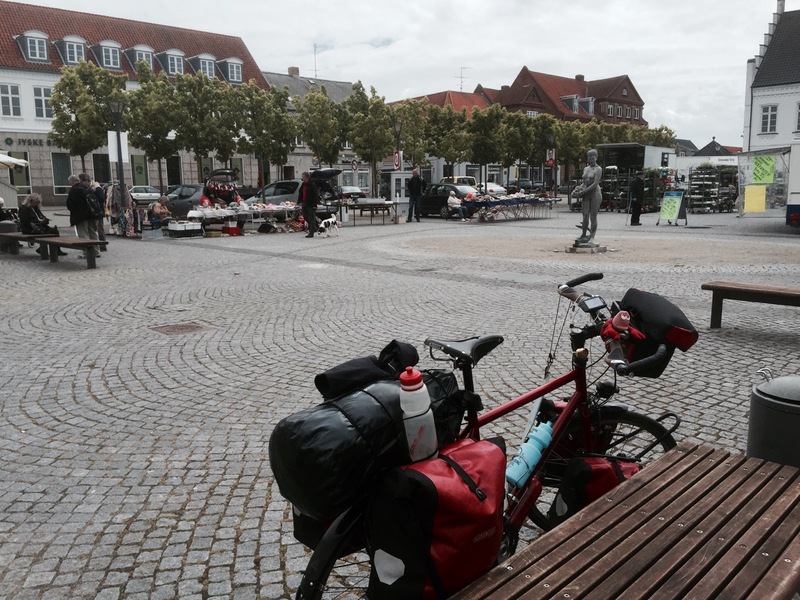 Larissa, Alex and Romulus were just finishing a week of touring around Northern Germany, and are heading home on Saturday; Romulus has done loads of cycle touring in the past though. Needless to say a fun evening was had, with a few beers and lots of chat about Europe, travelling, politics, and the economy, to name but a few topics. Claudio cooked pasta for everyone which was most welcome; in fact he kept producing food from his motorbike panniers. Thanks Claudio! Hopefully I’ll meet up with the all somewhere on the road in the future. One thing about a new country – you have to relearn things in the supermarkets; took me about twice as long to pick up supplies, however at least they still have mountains of Haribo still. All in all, a splendid day! 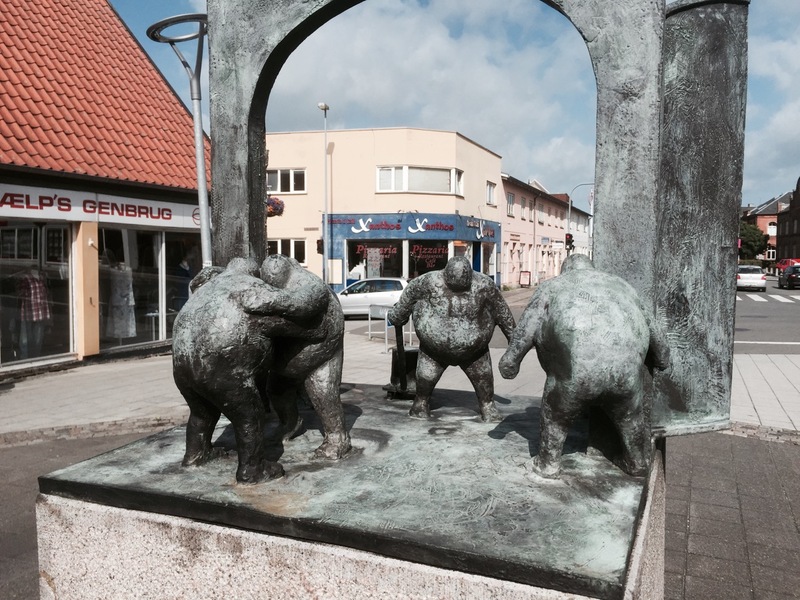 This entry was posted in Denmark, Germany, Self Propelled 2015 and tagged ACSI, Adventure, Bicycle Touring, Bike, buff, Charity, Countryside, Cycle Touring, Denmark, Europe, Expedition, Flensburg, Germany, photos, Self Propelled 2015 on June 6, 2015 by SelfPropelled. 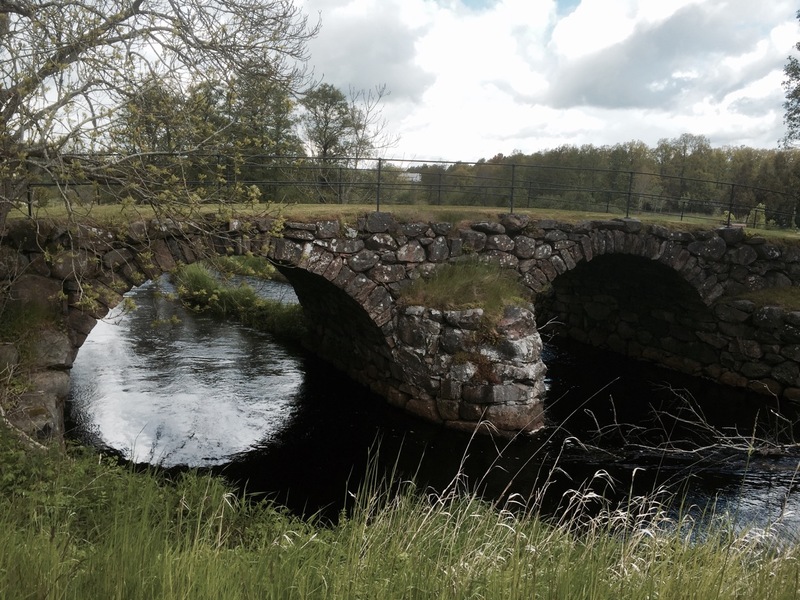 03 June 2015 – a bridge too far? You’ll notice a few of those kilometres were on the ferry from Tars to Spodsbjerg, providing a welcome respite from the elements! I slept well at Ore Sound camping, just outside Vordingborg, despite the wind in the trees making a racket all night; still, makes me feel cosy in my tent. 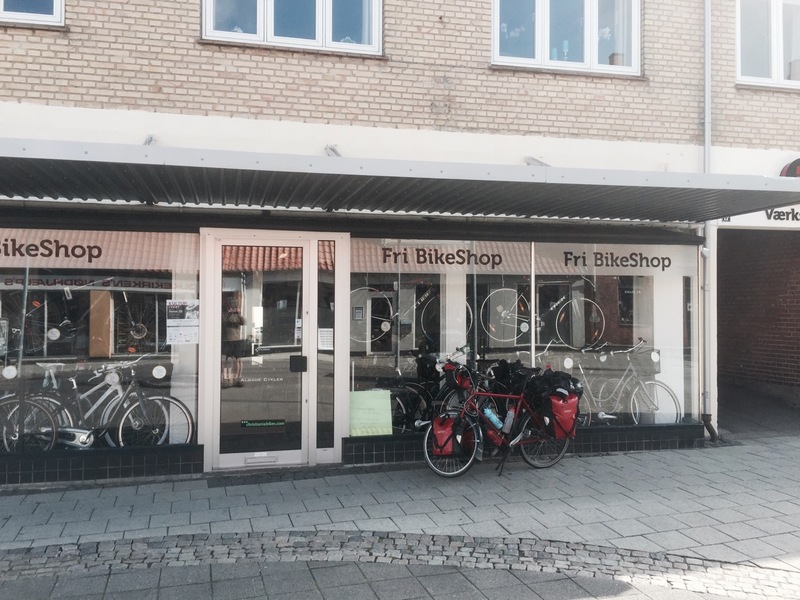 I was on the road in good time, and pedalled back into Vordingborg to a bike shop I’d passed yesterday to buy some more puncture repair glue; can’t be too careful, and I figured if I bought some I’d hopefully not need it, as opposed to not buying some and then immediately getting a puncture. 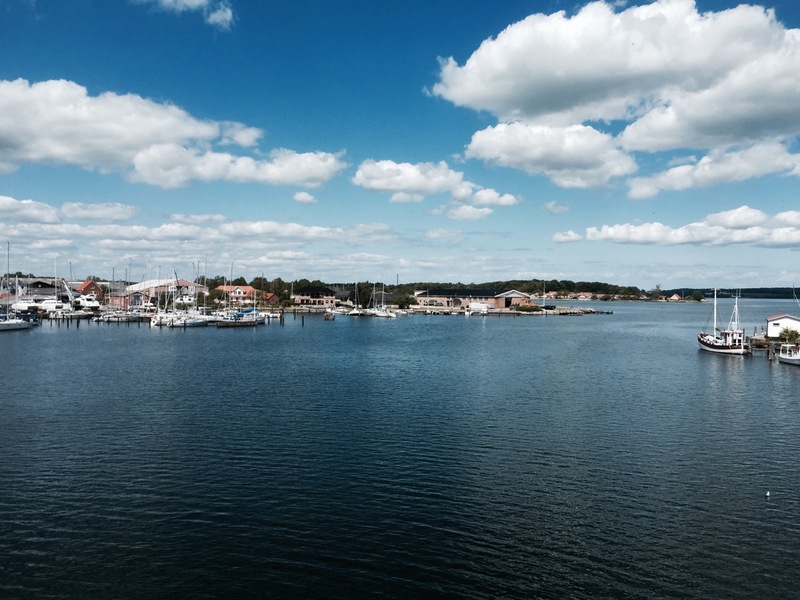 With the wind swirling about, but mostly being a strong westerly, I rode over the first bridge to the island of Falster. This is where I discovered it’s even more windy on exposed bridges, however at least it wasn’t raining. it was only a short leg over Falster, followed by a small bridge over to Guldborg on Lolland, a slightly bigger island. 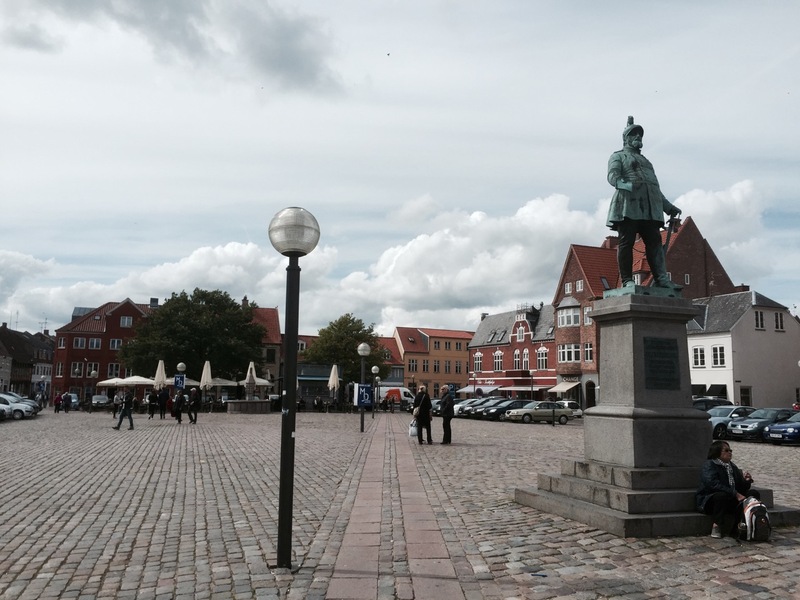 I stopped in the square in Maribo, where there was a small market going on, and had a break; Haribo in Maribo, plus bananas of course. After recovering a bit I rode on via a marked cycle route, when it didn’t divert me miles off course, down to Tars. Denmark needs to plant more hedges, there weren’t enough. 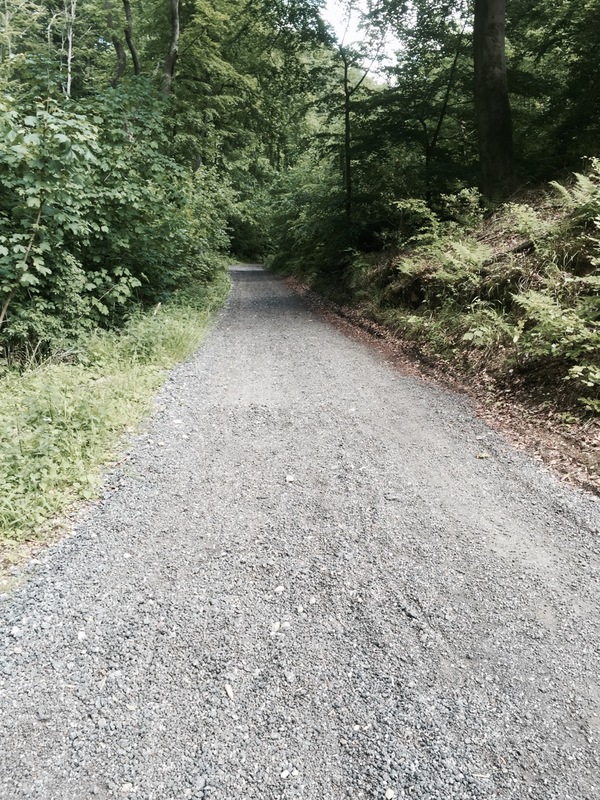 This was a really tough section of the ride, and very tiring. The wind, as well as making riding difficult, is a constant noise in your ears blocking out any other sound, so it’s hard to take anything else in. All you end up focusing on in a strong headwind is keeping going, and making another kilometre. I did however notice my left hand pedal start to squeak. This isn’t anything particularly out of the ordinary, random squeaks start and stop quite often whilst cycling, however coupled with the harsh conditions it added to my annoyance, and resulted in some choice words being vocalised in a loud fashion; no-one else around to hear luckily, aside from some slightly startled crows looking for shoes. I just made the ferry over to Spodsbjerg on Langeland, with about 3 minutes to spare, and had a nice break on the 10km crossing; think it was about 10km anyway. 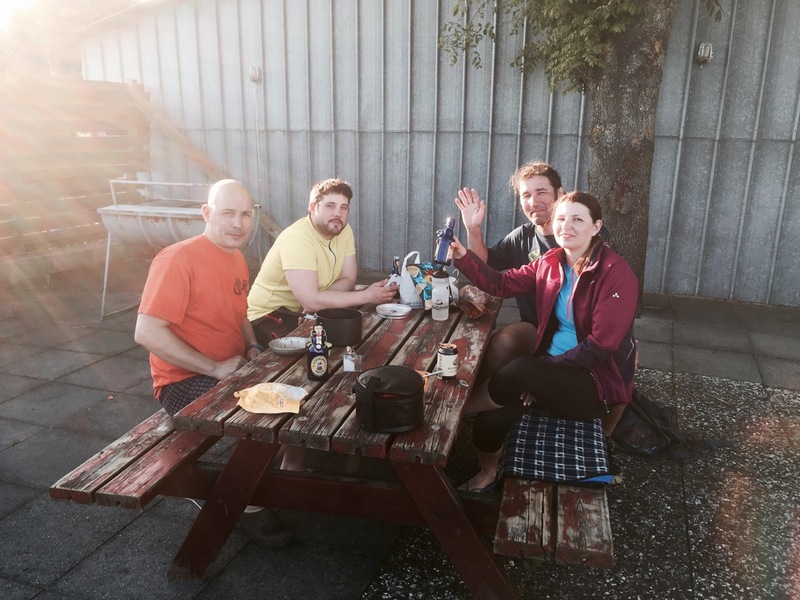 I indulged in a hotdog and Fanta, topping up my energy reserves and morale. It was quite a rough crossing, with a few waves breaking over the bow and soaking one unfortunate passenger; I must admit I laughed this. I was mostly hoping my bike didn’t get tossed about too badly, as even though I’d tied Smaug down there were a few big hits. After the ferry I pedalled over Langeland quite quickly, following a marked cycle route for the most part, before taking on the next challenge; a set of two bridges over to Tasinge. The first bridge was quite high, and very exposed. 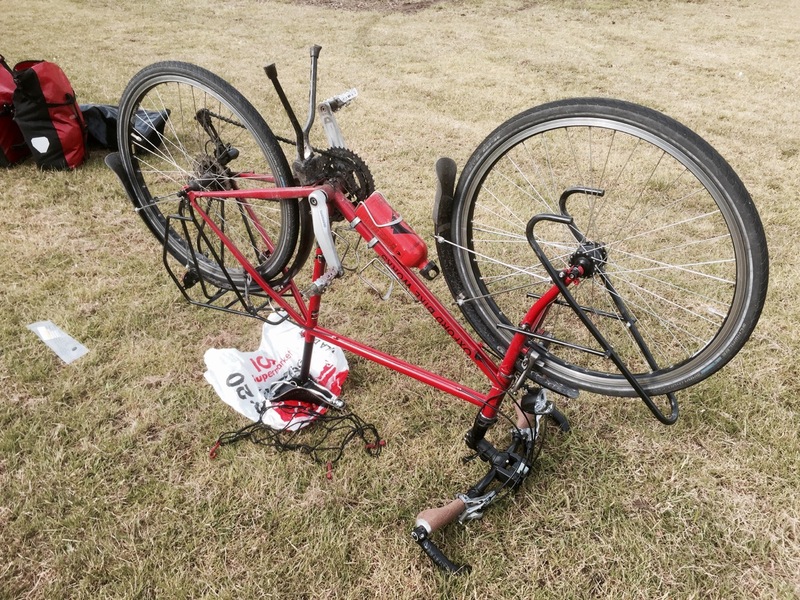 I ended up walking my bike over some of it as the cross wind was just to strong to go in a straight line. I made up a marching song about Denmark and strong wind which I’d better repeat right now, but it might come out in the pub at some point. After the mini island of Sia the second bridge was flatter and more manageable, but it was a relief to get over to Tasinge. I passed a few cycle tourers going the other way as I approached my destination for the night, with smiles and waves giving me a much-needed boost. I’m not sure where they were going to stop for the night, but if they were camping on one of the smaller islands they were in for a rough night. 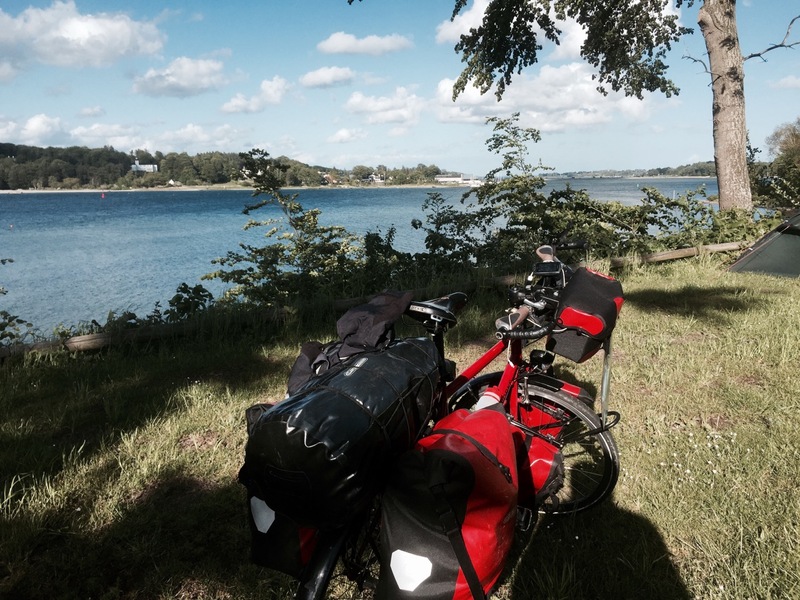 I ended up stopping just prior to the bridge over to Svendborg, turning off to a campsite near Vindeby; Svendborg Sund Camping. As with many of my camping stops I’d found this site using the ACSI app on my phone, which is proving very useful. 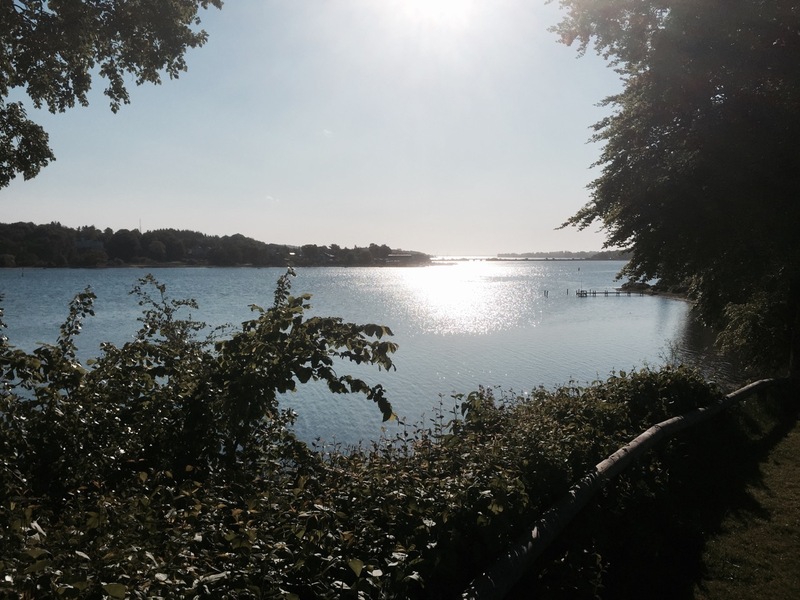 Svendborg Sund is a lovely campsite, and the owner was very welcoming, pointing me in the direction of a picturesque and sheltered place to pitch my tent. 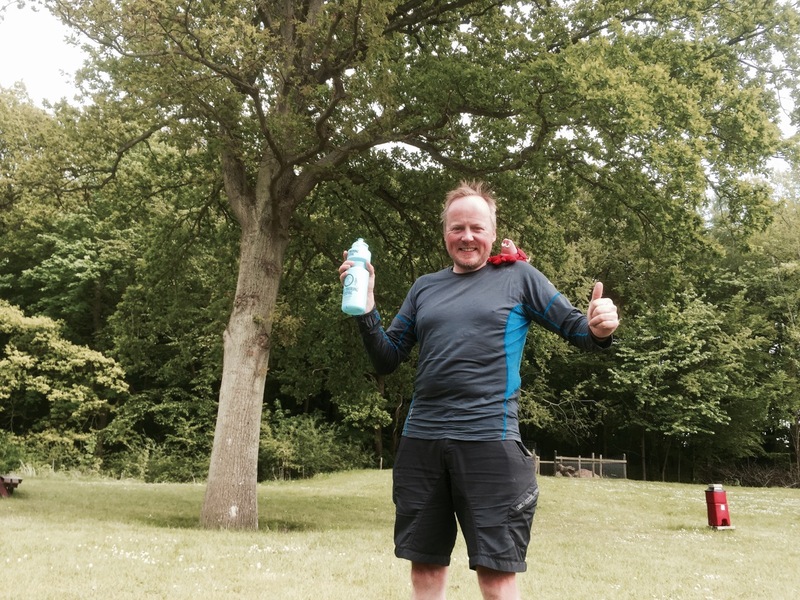 I bought a couple of recovery beers from the campsite shop, then set up, had a hot shower, and felt a lot better. I felt a sense of accomplishment at having overcome the headwind to manage a respectable distance for the day. It was nice to settle down in the common room for the evening, and plan the next day’s ride. Just down the hill I watched a young man setting up quite a display which he later used to propose to his girlfriend; there was a small pavilion tent, a rose lined carpet to it, candles and all sorts going on. I didn’t take a photo as didn’t want to interrupt; he already looked very nervous. Hope he got a good result! Excited about tomorrow; wind is supposed to drop, and pedalling out of Denmark to Flensburg in Germany, so last night in Scandinavia. Really feel like I’m making progress now, and looking forward to the next few weeks. 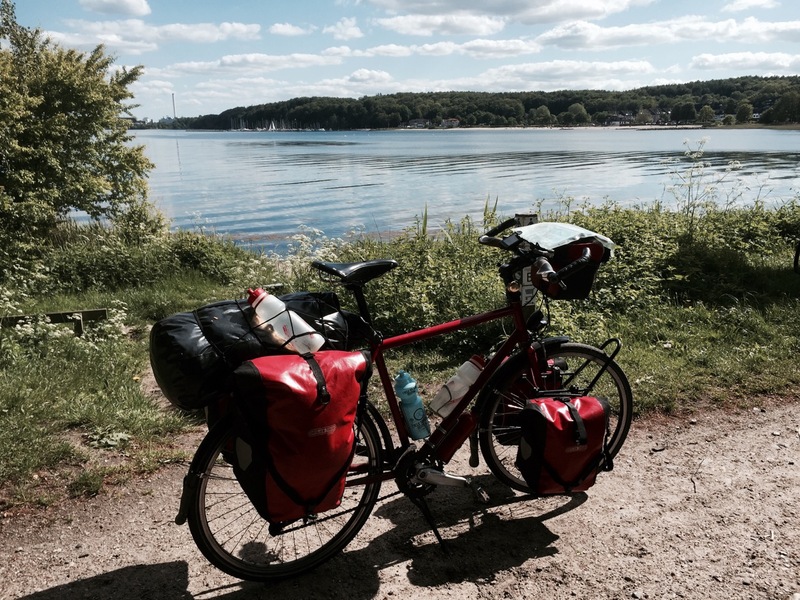 This entry was posted in Denmark, Self Propelled 2015 and tagged ACSI, Adventure, Bicycle Touring, Bike, Charity, Countryside, Cycle Touring, Denmark, Europe, Expedition, headwind, photos, Self Propelled 2015, Svendborg on June 4, 2015 by SelfPropelled. 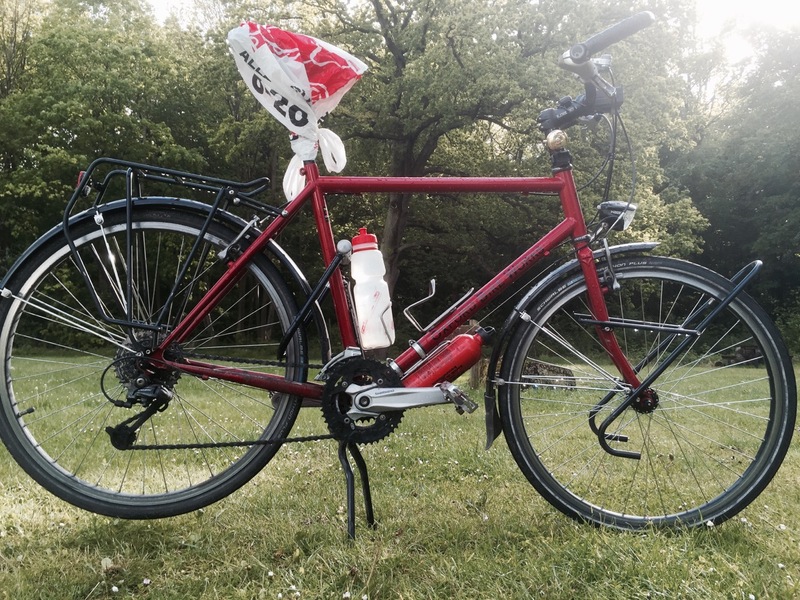 It feels really good to be writing this from a new country, having spent about 3 weeks pedalling through Sweden. 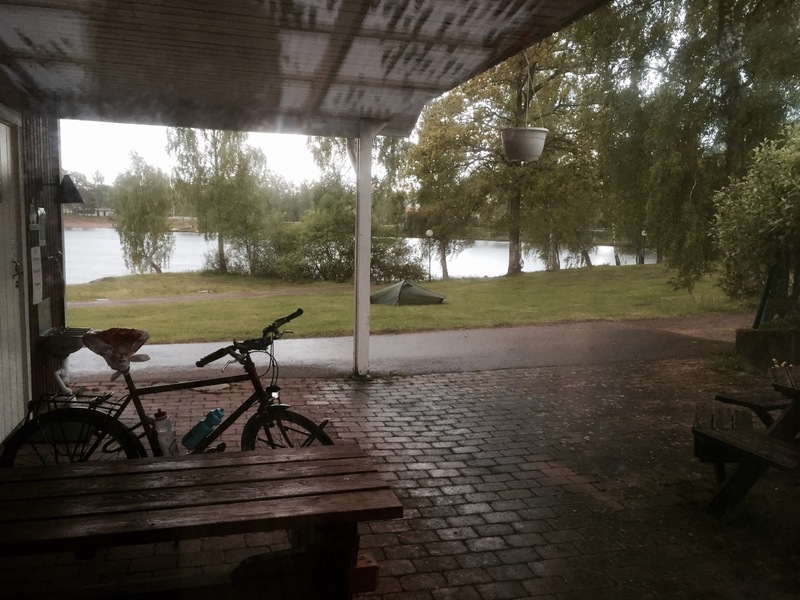 Whilst I enjoyed Sweden, the weather over the last week has been dubious to say the least, and whilst it may not improve in Denmark it’s like a fresh start, with new adventures ahead. 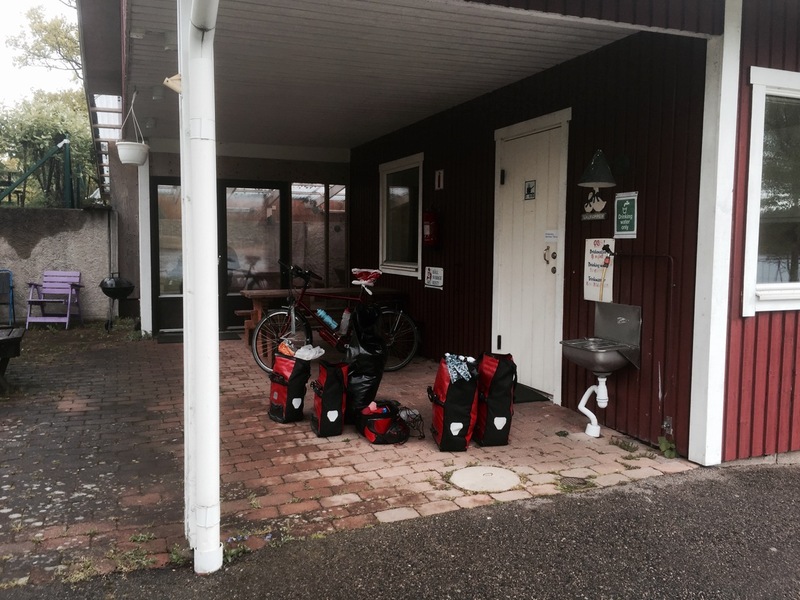 Here’s a link to today’s ride, 103km in about 6.5 hours, although 4km of that was on the ferry from Helsingborg to Helsingor; got to get over the Oresund somehow! 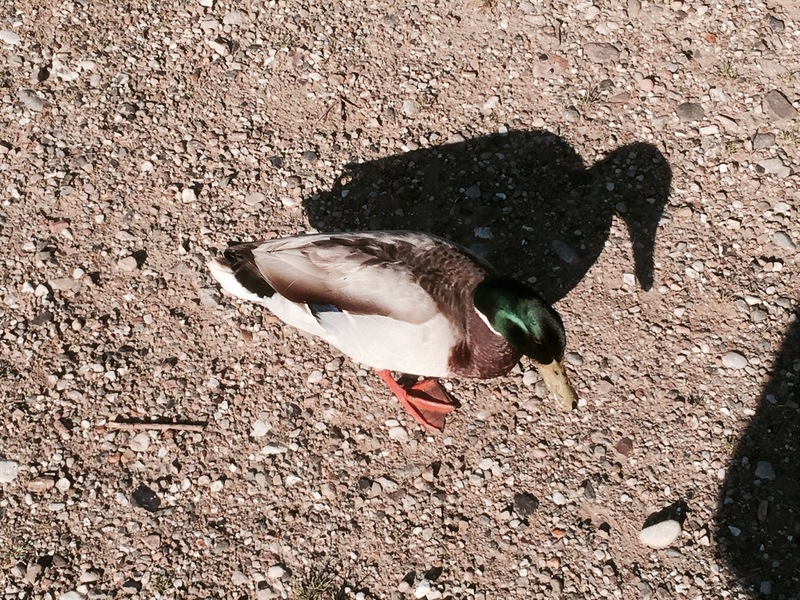 It was good weather for ducks again when I woke up, quel surprise! Seems to have been a consistent theme over the last few days. 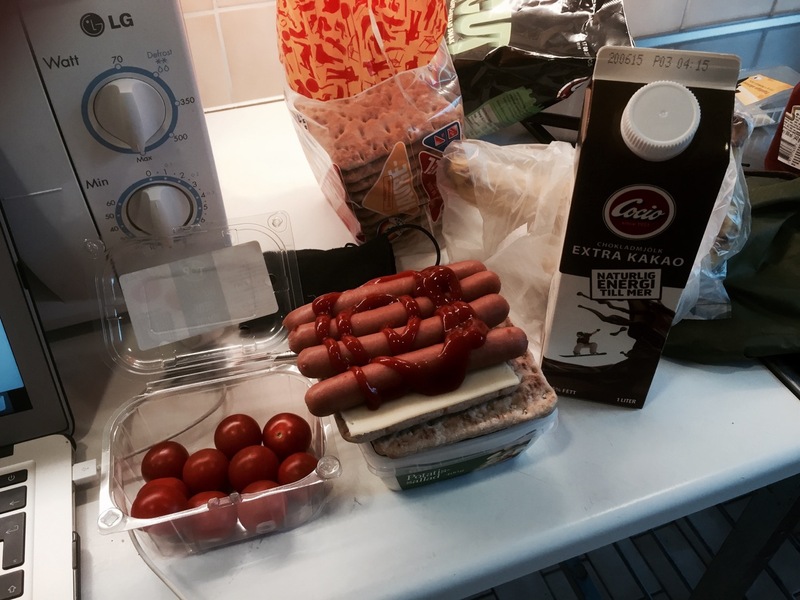 At least I was feeling energised after last night’s feast of hot dogs and potato salad, with a side of tomatoes and chocolate milk. 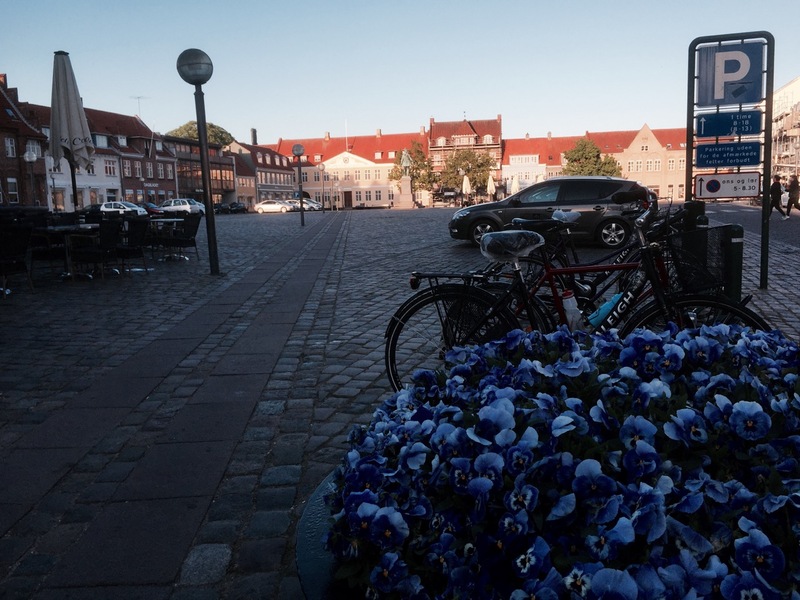 I was up early to try and get to Helsingborg in good time, and then over to Denmark, so I packed up quick after a breakfast of cheese and tomato sandwiches. As with yesterday this involved packing stuff into panniers inside my tent, however I had the added bonus of a porch to scurry to, to get out of the wet. Still had to pack my tent up damp though. I was pedalling out of Markaryd by 08.15, through a very sleepy looking town, with evidence of last night’s festivities strewn along the main street and around the central square; food wrappers and empty cans/bottles in abundance. It must have been a good party! 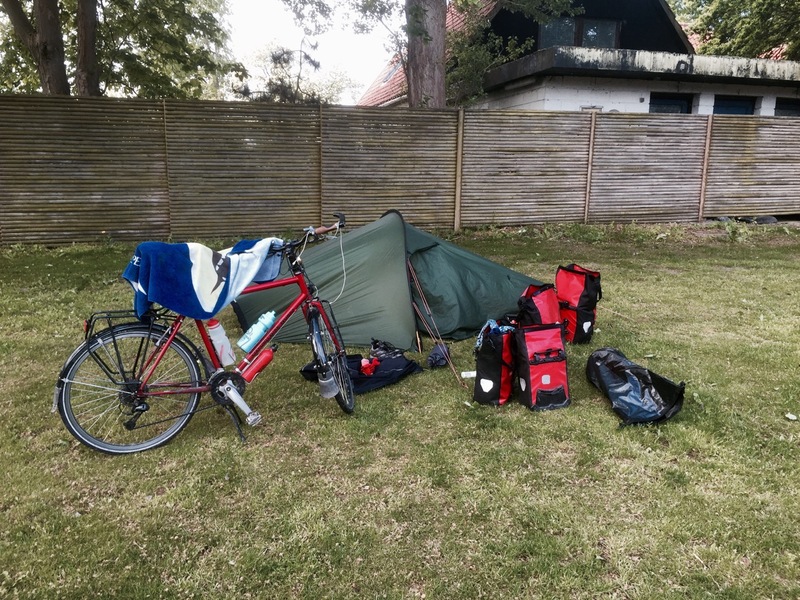 In fact I knew it had been a good party as I could hear it from the campsite last night, although it didn’t stop me falling asleep – noise rarely does when I’ve cycled a long way. From Markaryd I rode South West, following small roads alongside the E04. 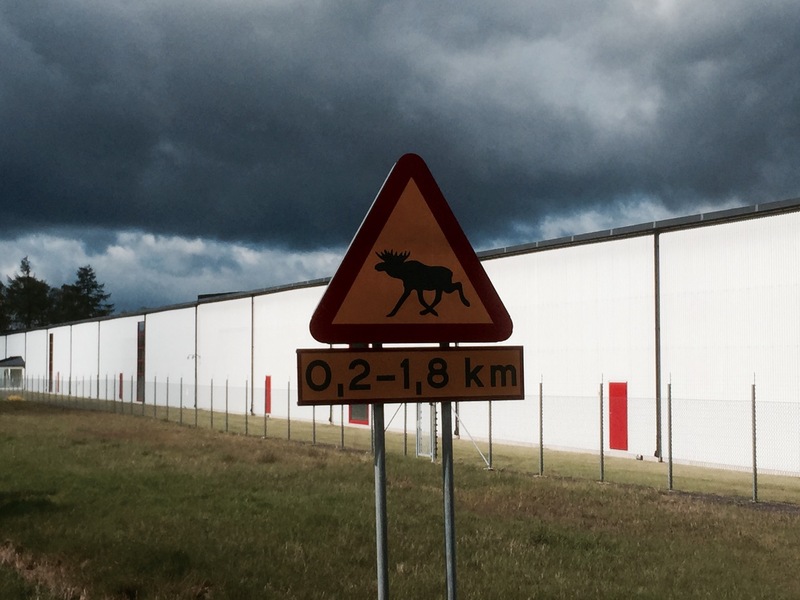 Passed a sign warning about moose again, but I still haven’t seen any in Sweden. The weather initially improved, with the rain abating, and sun coming out; nice to feel the warmth after being damp and chilly for while. I got some singing going to keep morale up as the dark clouds gathered on the horizon. Around Orkelljunga the weather turned again, with a fierce squall coming through, leaving in its wake a blustery headwind. To add a little bit of the exotic to the weather menu it started to hail at one point, a break from the rain at least, but it stung rather; nowhere to hide when your pedalling along an exposed road through fields. I did spot a bear though. 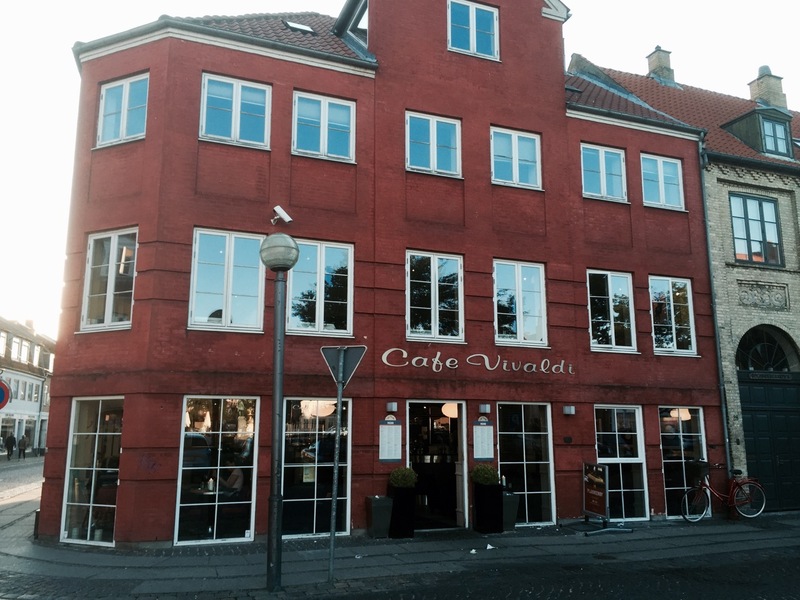 On the outskirts of Helsingborg, with only about 15km to go, I retreated to a Max Hamburger restaurant feeling somewhat beaten and bedraggled, but at least the sun had come out. Feeling a bit bedraggled, burger stop! Having frequented Max several times whilst in Sweden, it felt only right that I partake one more time of the bacon cheeseburger meal, a morale booster in itself, and perhaps my last meal in the country; okay so not very flash or healthy, but loads of calories. 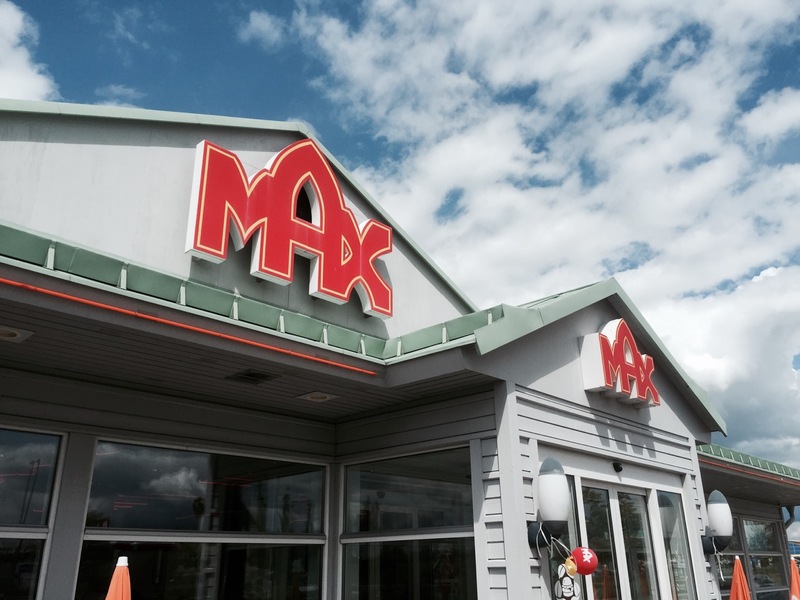 Last stop at Max burgers? 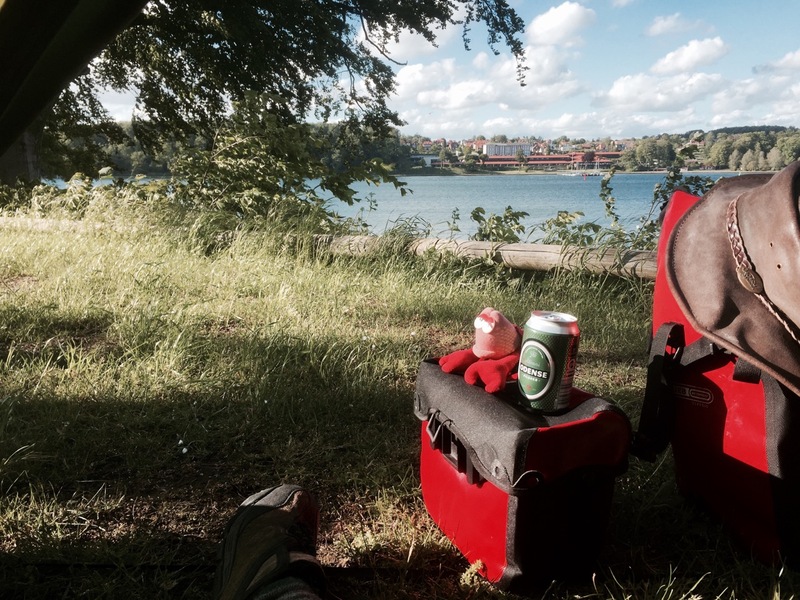 Then it was just a case of getting into Helsingborg, how hard could it be? Quite hard as it turned out, due a few confusing road signs and lack of cycle paths taking you into the city. 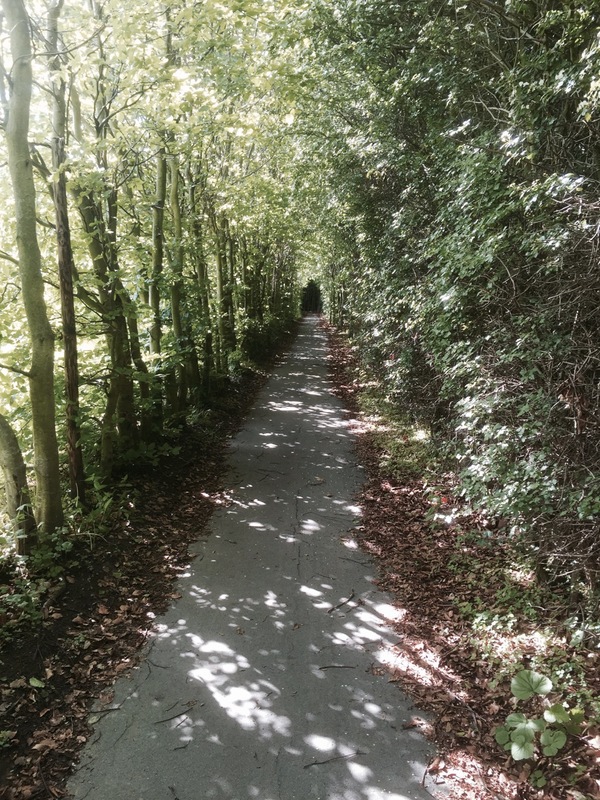 Yesterday I cycled along deserted country roads, that had wide cycle paths running alongside them, through forest. How come when you get to a big city like this there aren’t any? Maybe they were there and I couldn’t find them. At least the drivers were their usual patient and polite selves. After a bit of cursing, partly due to the wind, and partly due to navigational issues, I made it into the centre where a plethora of cycle paths spring up, which was a bit maze like until I found some signs pointing me in the direction of the ferry. It wasn’t really that tricky as I just needed to head SW until I hit the coast, I was just in a bad mood due to battling headwinds and hail. 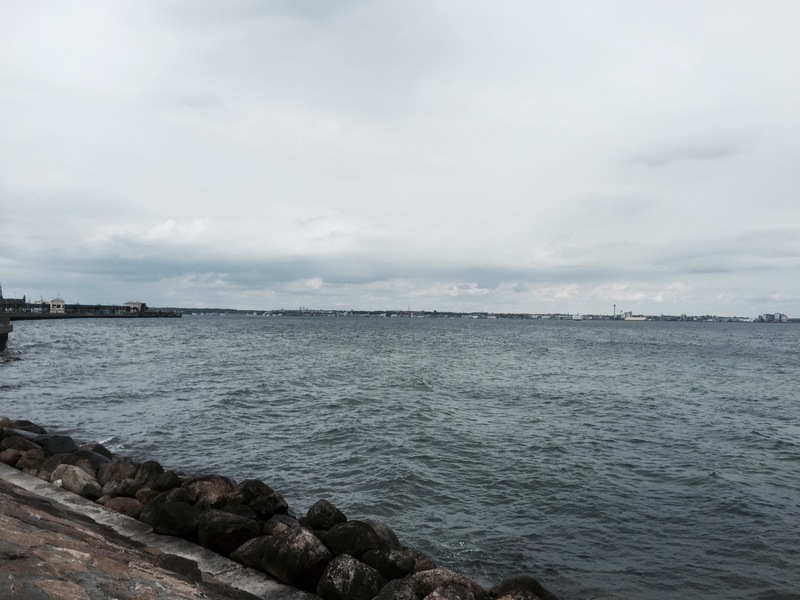 My sour mood evaporated as I got into Helsingborg and saw the Oresund for the first time; the narrow stretch of sea/strait that separates the Baltic from the Atlantic. 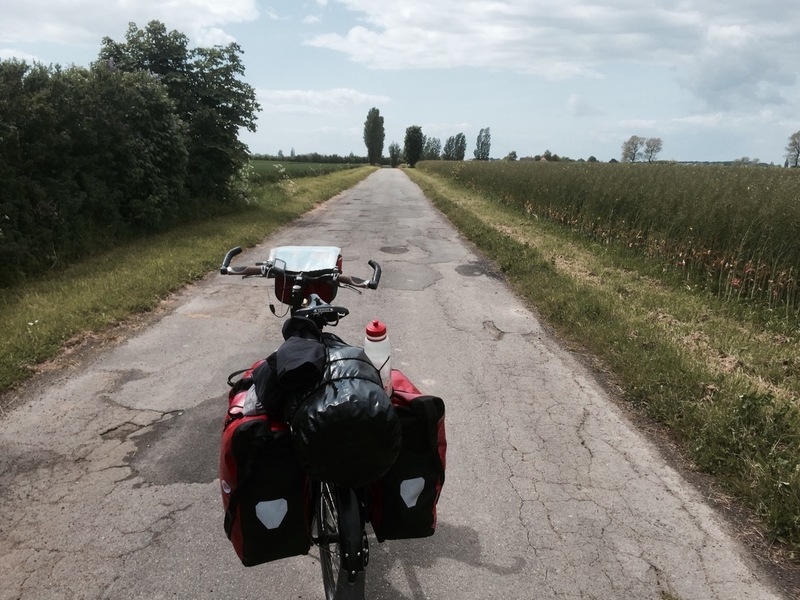 It was exciting to see Denmark just 4km away, with pastures new to be pedalled. 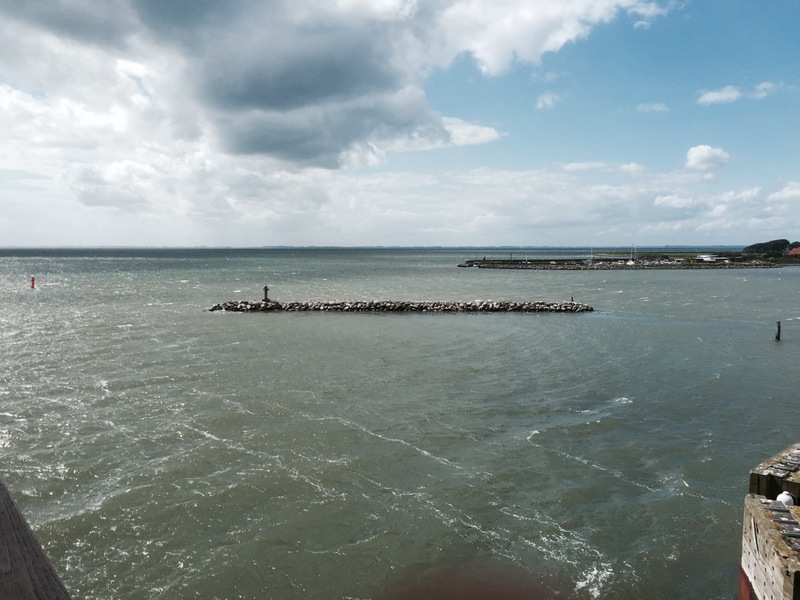 The strait looks very busy, with lots of ships going back and forth, or through it; apparently the Helsingor-Helsingborg car ferry is the busiest the world. I wondered how submarines make it through without bumping into something, or in the case of the Russians, undetected; maybe they don’t. 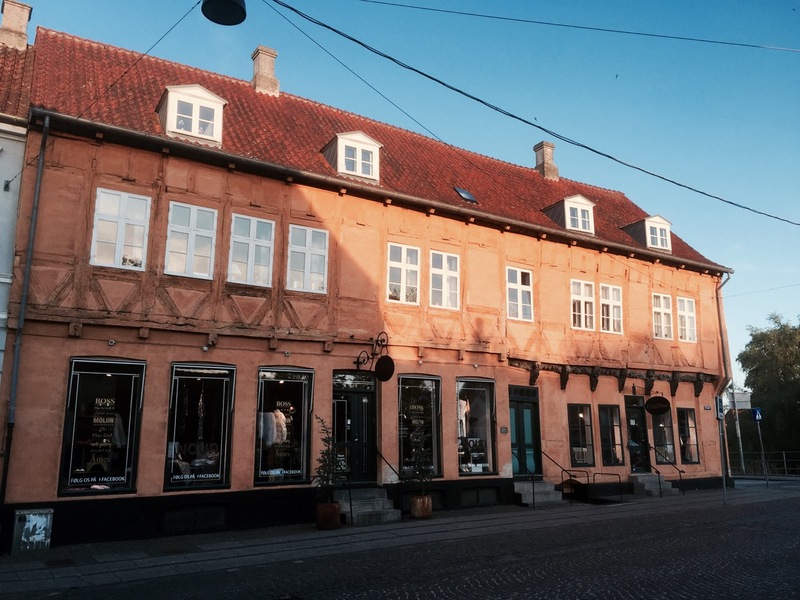 I had a look at the old Keep above Helsingborg, the only remaining building from the once mighty Helsingborg Castle. 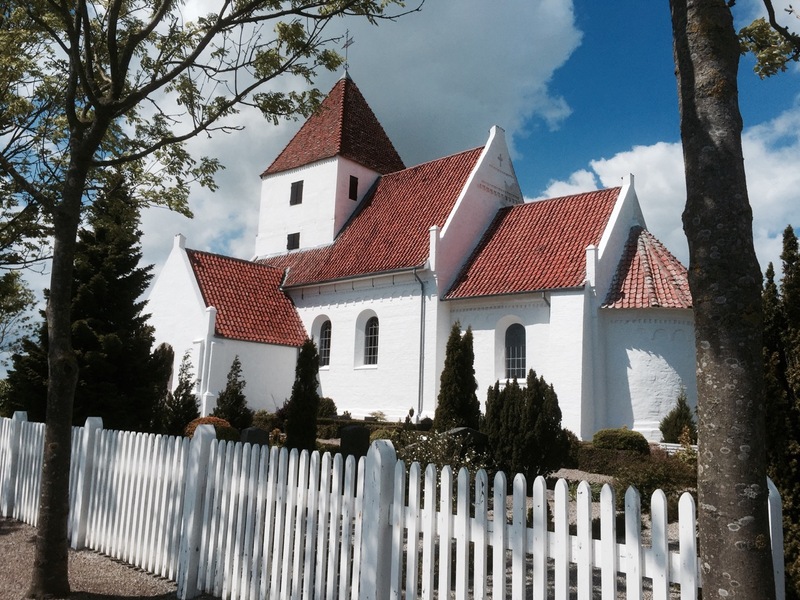 The original castle was built by the Danes, and has origins maybe as far back as the 11th century, however the present form was built in the 13th century. The castle was demolished in the 17th century when the Danes were kicked out by the Swedes, with only the keep remaining; think the keep was meant to be demolished but the Danish king never gave the final order. 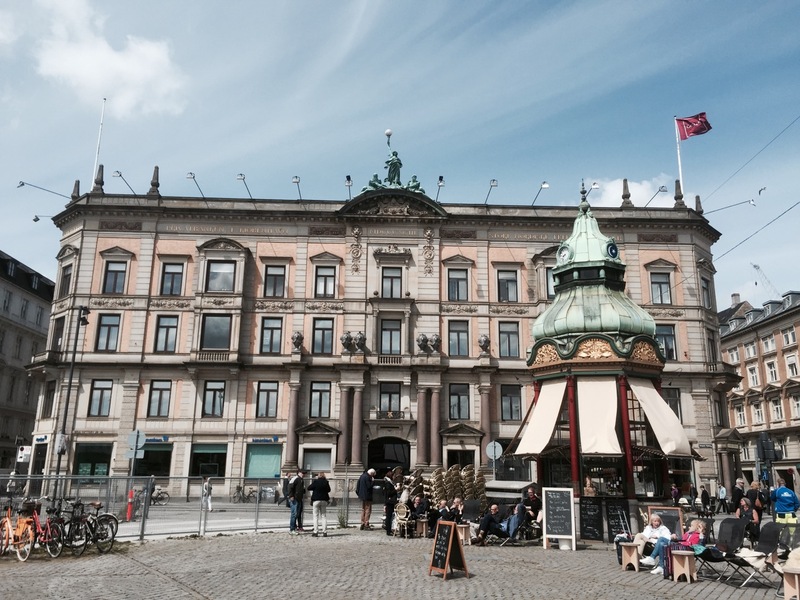 Here are a few pics from my brief tour of Helsingborg. After the Keep I rode down the hill to the Skandlines Ferry terminal, taking the lift, with my bike, to the ticket office on the 2nd floor. 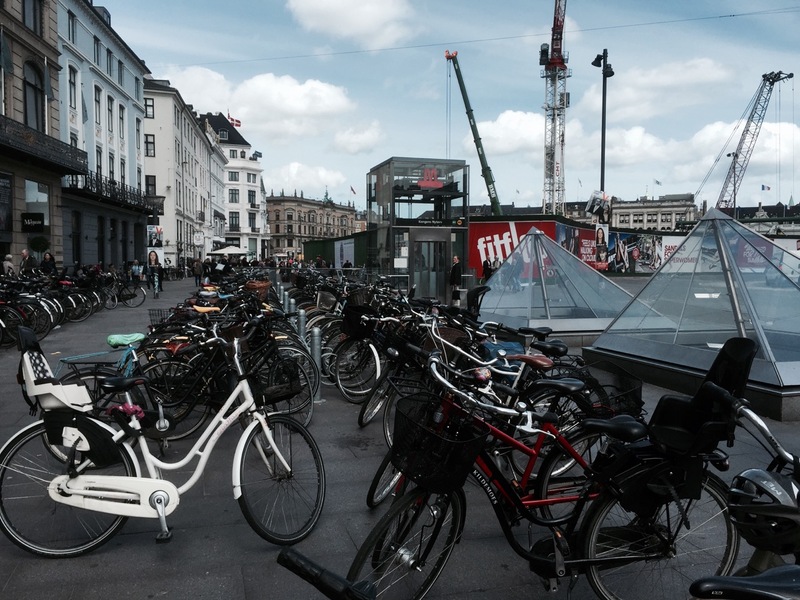 I purchased a ticket, 35 SEK, a bargain, but as it happened I could have just pedalled around to the car embarking point and bought one there. Still, it was fun taking my bike in the elevator. There were a lot of other road cyclists getting the ferry over, presumably after whizzing about in Sweden for a Sunday afternoon ride. I got out of the wind for a bit and raided the onboard shop for a few supplies of a confectionary nature; Toblerone and Haribos mostly. I was trying to use up my remaining Swedish Krone, so I bought a celebratory beer too. I must have looked a bit of a sight swigging beer from a bottle, looking rather dishevelled and weather-beaten. I got a few curious looks from other passengers and MAMILS, but just smiled back at them, feeling very satisfied that I’d completed the Swedish leg of my tour. Arriving in Helsingor I was first off the ferry, along with all the other cyclists who quickly left me in their wake; they weren’t carrying +25kg of gear! Unfortunately I managed to forget about Kronborg castle, which I had intended to have a look at, it being the setting for Shakespeare’s Hamlet and an impressive edifice. I think I caught a glimpse of it from the ferry, and have just looked at pictures of it on Google anyway; the wonders of the Internet. I could go and take a look tomorrow but hate going backwards, so unlikely. 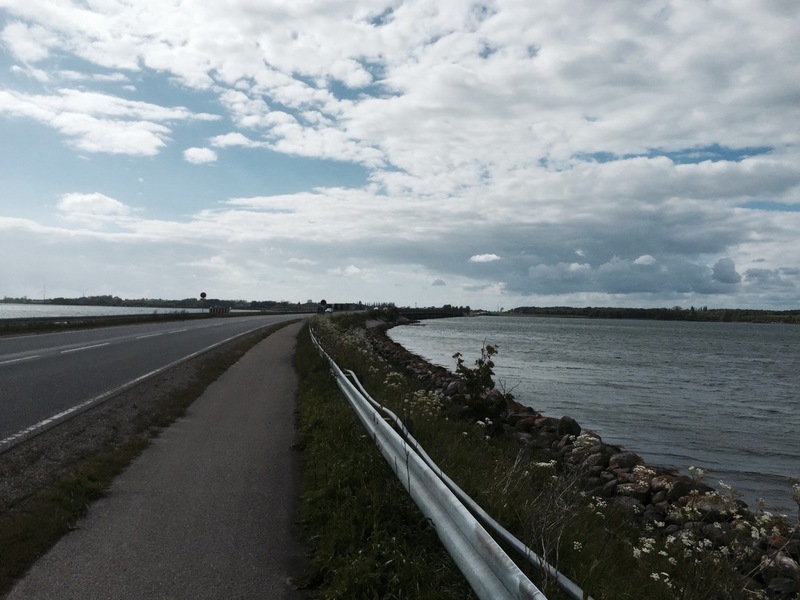 Instead I pedalled along cycle paths alongside the coast road towards Copenhagen, noticing immediate changes from Sweden. The road signs are different colours, as are some of the road markings; blue around roundabouts for cycle lanes. Some of the house are very similar, whilst others are covered in carvings and have thatched roofs. 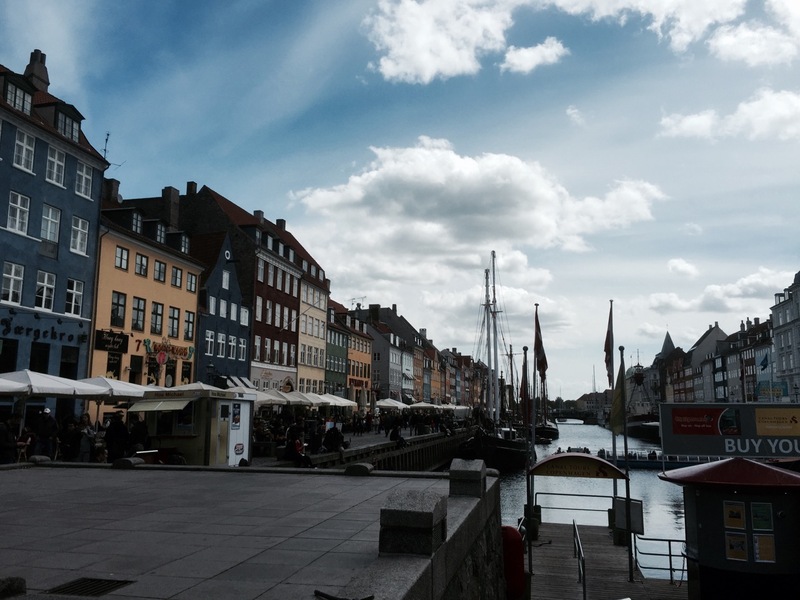 It also seemed busier, more built up and more people, but that might just be the proximity to Copenhagen. 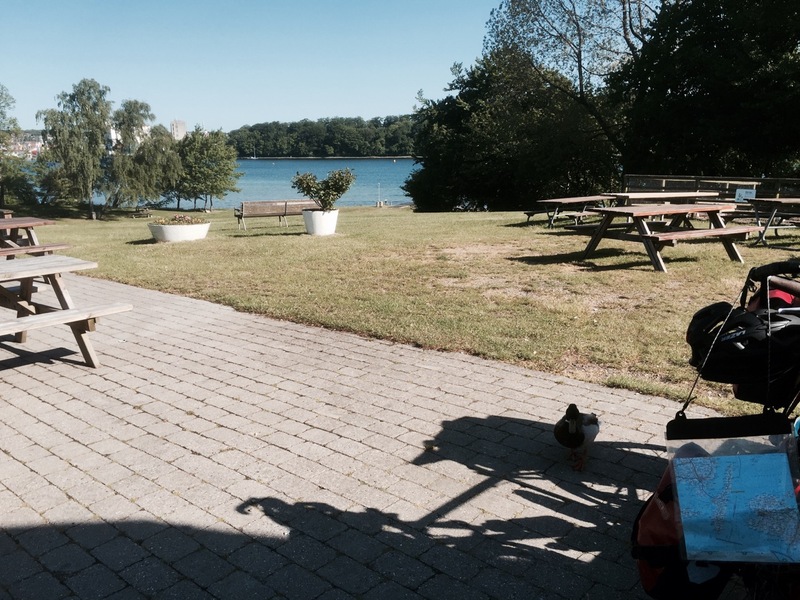 I made it to Niva and found a good campsite for the night, after being passed by dozens more road cyclists out for a spin; cycling seems to be as popular if not more-so in Denmark, compared to Sweden. It really was a relief to stop for the day, in a new country and somewhere that felt a lot warmer; which is odd as it’s only a few kilometres from Sweden; might just have been on my head. It was just nice being out if the wind and having some sunshine to relax in, and even nicer to have a hot shower. I was slightly concerned by the campsite goats, which I think are used to keep the grass short; I hoped they didn’t nibble my tent, not sure how I’d fix such colossal varmint damage. Once set up I headed down to the Marina to the restaurant recommended by the campsite owner, for a celebratory meal and a couple of beers. It turned out to be an excellent meal, of lamb, new potatoes, green beans, asparagus, red current sauce and gravy; nicest meal of the tour yet. Feeling relaxed I rode back to the campsite, to do some planning and write this. 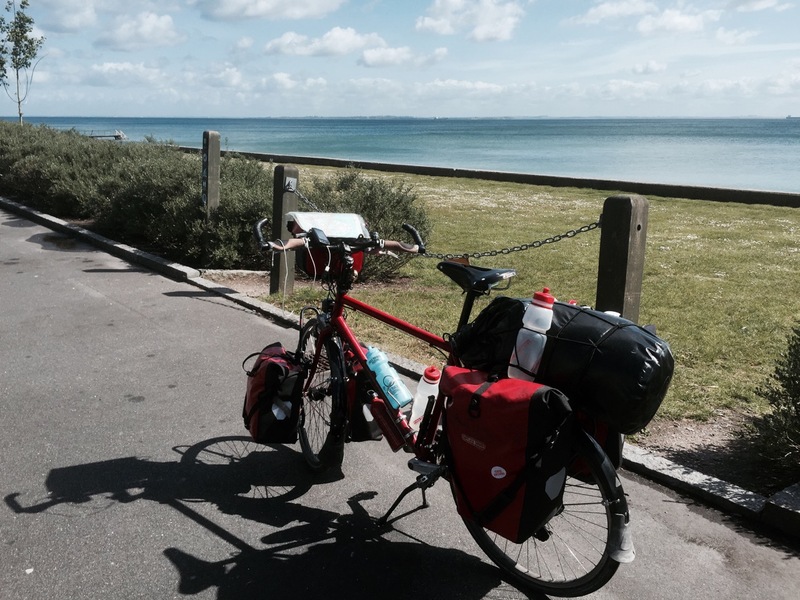 I chatted to a fellow cycle tourer for a bit, out on her first 2 week tour and enjoying it despite the weather. As always you learn lots on your first tour, and I think she’s caught the bug! To finish up here are a few stats from the tour so far. If you think of any other interesting stats to share let me know. 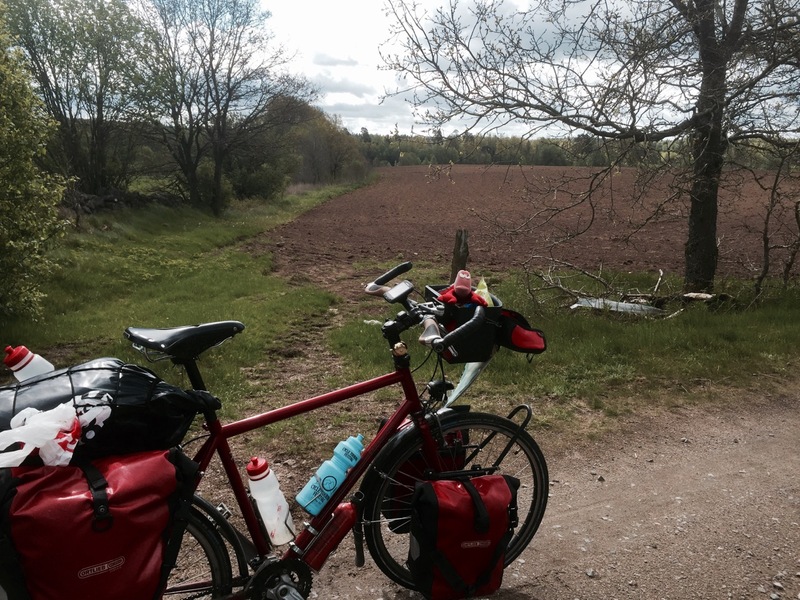 This entry was posted in Denmark, Self Propelled 2015, Sweden and tagged Adventure, Bicycle Touring, Bike, buff, Charity, Countryside, Cycle Touring, Denmark, Europe, Expedition, Nordkapp, photos, Self Propelled 2015, Sweden, varmint on May 31, 2015 by SelfPropelled.